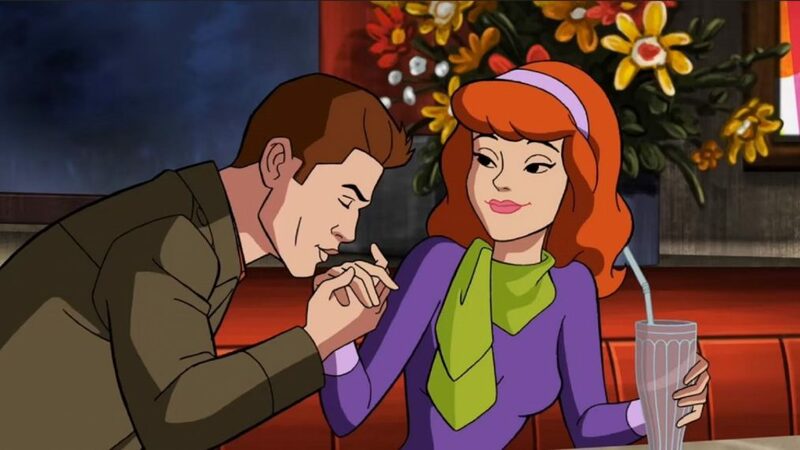 Dean Winchester makes some moves on Daphne in the animated episode. It's a perfect example of worlds colliding. On the March 29 episode of Supernatural, the Winchesters are heading into another world—the cartoon world of Scooby-Doo, that is. Ahead of its highly anticipated airing, The CW revealed the first trailer for the crossover episode which will find Sam (Jared Padalecki) and Dean (Jensen Ackles) sucked into TV, where they'll meet a spooky cast of characters. What could possibly be better than two ghoul-fighting teams joining forces? Until now, the amount of Scooby characters involved was a mystery, but the trailer proves that the whole Scooby gang is getting in on the action. Fred, Daphne, Velma, Shaggy and Scooby will all be appearing alongside Sam and Dean, as well as Castiel (Misha Collins). Check out the spook-tacular trailer below. It may only be a few seconds long, but it's never enough for fans—who, if lucky enough to attend, can see the episode early when it premieres at PaleyFest 2018. The episode is certainly pushing the boundaries of where Supernatural can go in terms of episodes, and we just wonder what else the series has up its sleeve for future episodes. Thankfully, the wait won't be long now, since the episode is less than a month away now.